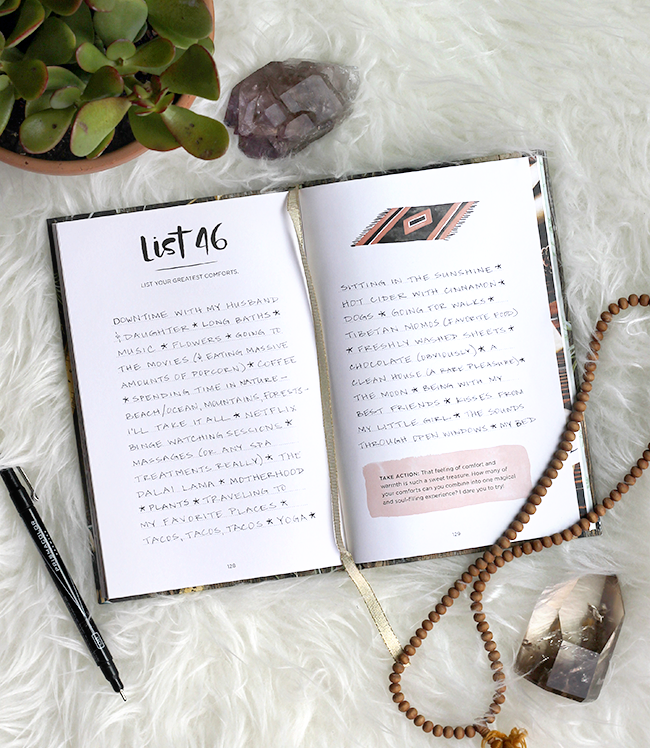 Over the years, you guys have seen jewelry made by my friend Moorea Seal, as well as goods from her gorgeously curated shop, featured here on the blog. 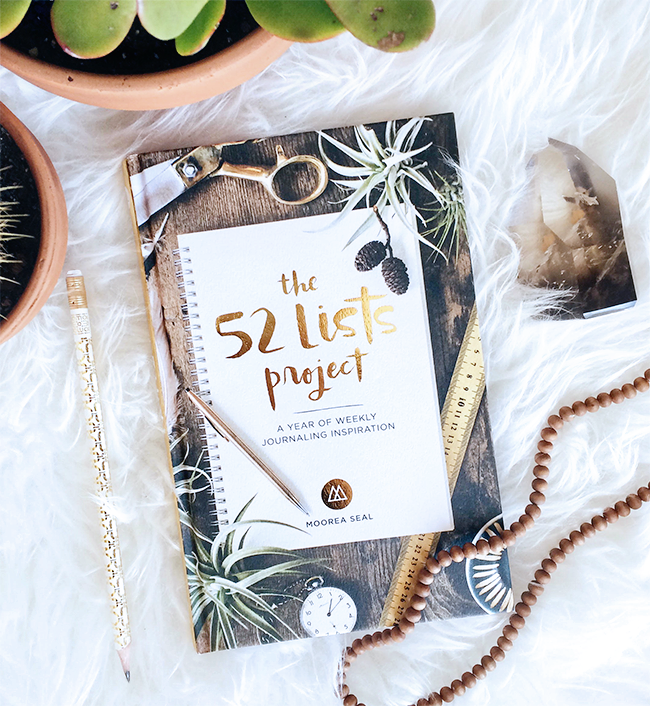 Today, I’m so excited to announce that her very first book, The 52 Lists Project: A Year of Weekly Journaling Inspiration, is being released! (And one of you is going to win a copy of you own; more on that in a minute.) Not only is Moorea a talented artist and incredibly successful business owner, she is also a genuine, kind, caring person who makes it her mission to empower girls and women of all ages. I was sent an advance copy of her book last month, and I can’t tell you guys how much I’ve been enjoying creating lists (and staring at the impeccably designed pages and cover – hello gold foil!). 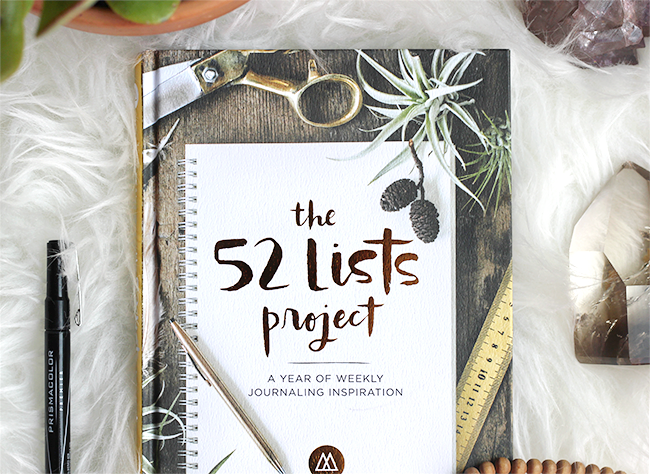 A journal of seasonal lists (that began as a project on Moorea’s blog where she would post a list each week, share her responses, and invite her readers to complete their own lists), The 52 Lists Project features a list for each week of the year, with space for your personal responses in between beautiful illustrations and photographs. 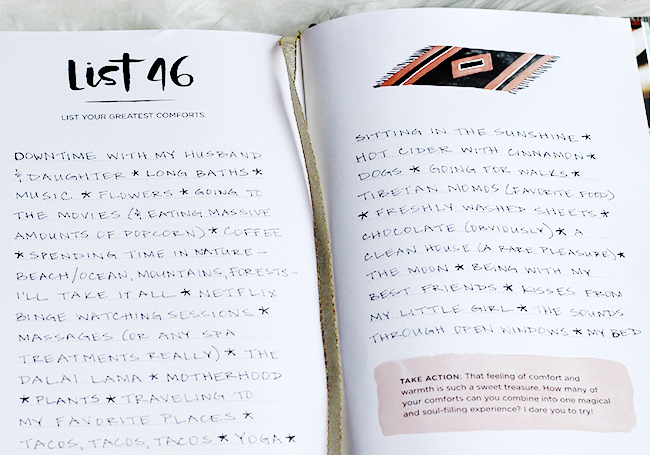 Today I wanted to share one of my favorite lists from you, taken from the Fall section section of the book, called ‘My Greatest Comforts.’ There is something therapeutic about list-making in general, but to sit down and reflect for a few quiet moments on the things in life that bring me the most comfort, along with the act of hand writing them down, was downright restorative. 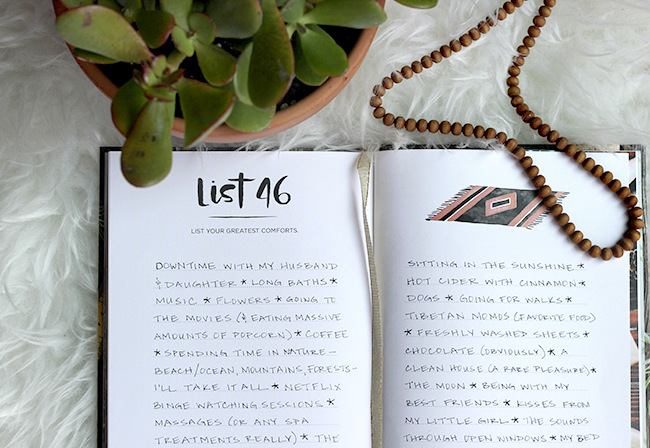 I felt refreshed after making the list, and the list itself has served as a great reminder for me to consciously partake in at least one (hopefully more!) of these comforts every single day. In case you can’t read my handwriting in these images, here is my list of greatest comforts: downtime with my husband and daughter // long baths // music (too many types and bands to list) // flowers // going to the movies (and eating massive amounts of popcorn) // coffee // spending time in nature – beach/ocean, mountains, forests – I’ll take it all // Netflix binge watching sessions // massages (or any spa treatments really) // the Dalai Lama // motherhood // traveling to my favorite places // tacos tacos tacos // yoga // sitting in the sunshine // hot cider with cinnamon in the fall // dogs // going for walks // Tibetan momos (my favorite food) // freshly washed sheets // chocolate (obviously) // a clean house (a rare pleasure as I am very messy) // the moon // being with my best friends (many of whom live far away) // kisses from my little girl // the sounds throughs open windows // my bed. In celebration of Moorea’s book release, I’m thrilled to announce that one lucky Bubby and Bean reader is going to win a copy of your very own! See below for how to enter. And if you can’t wait (I wouldn’t be able to! ), you can go purchase your own copy right now right here. Big congratulations to Moorea on the day of her book release! I can’t wait to spend the year filling it out.